What a gloriously busy week! I’ve spent most of it either teaching, or preparing new classes to teach, or finishing up articles for the next couple of months. Have barely come up for air – and there are still to classes to finish preparing for yet today. How are you doing during this slow, quiet November? Getting ready for the holidays? Are you getting as much mail and email as I am about Black Friday? Have you ever been shopping in the stores on that Friday after Thanksgiving? I tried it once – when I was 18 or 19. Scary. Haven’t been brave enough to return since. I had never people fight over clothing or small appliances or before, like that (and we were poor, let me tell you!). They grabbed at things and practically tore them apart to get them first – much like folks at the wedding buffets, come to think of it. Anyway, these days, you can get similar deals online – all over the place, without leaving the comfort of your home, desk or computer resting place. But do your price comparisons first. Some things that look like a deal, well, it may not be one. On the other hand, you don’t have to wait for Black Friday to find deals. I was telling Lulu that we need a printer in the back office. We put one of the old ones back there, since we don’t need to print from there as often. But it’s really crummy. Never mind why. Long story. But…she visited Quill online – where we get many of our office supplies. And ta daa! Yesterday was the last day of a deal on the perfect $159 HP printer – for $59. And there’s no charge for delivery. And they toss in a tin of Mrs. Fields Cookies (or is it Ms Fields? ), too! (Pretty much, Quill and Office Depot are our main sources of office stuff, because of the great prices, no-charge delivery, and sensible return policies. )So, do your shopping around – and don’t wait for mass sales days. There are good prices all around you, every day. 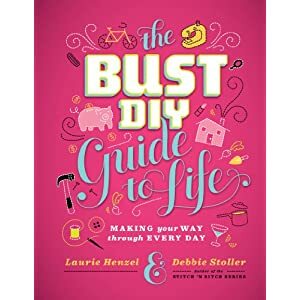 I am leaving the picture of the new BUST DIY Guide to Life: Making your way through every day here, from last week, because I like the way it looks. Ain’t pink grand?! In IRS News this week, we get some new legislation – that utterly confuses me. Tax Professionals are getting scary letters from IRS – and it’s not even Halloween! In today’s Money Funnies & Inspiration, we get to learn the REAL value of our charitable contributions. See what happens to Harry and Esther. Small Business Taxes Made EasyThe new, award-winning Small Business Taxes Made Easy is getting lots of attention. Andrew collected some of the reviews and awards generated by this book. I give your book to all my clients. They love it. When they have questions, I just tell them to read the book. The answers are in there. And it also gives them a better idea of what questions to bring to me. This week’s question for you – What kind of tax benefits can I get if I own my own business? TaxMama has an 8-hour course designed to help you pass this exam if you feel you need one. However, I advise you to take the exam without paying for any course at all, first. This class starts at CPE Link on Monday. There is still time to sign up for TaxMama’s EA Exam Review Course. There is a Family Member discount of 10%. AccountingWeb Blog is all about the job opening at Intuit for the Ask a Tax Expert positions– about 100 of them! Don’t tell me there are not job openings! (Intuit is STILL hiring.) Some of my friends got hired. Have you? Last month’s MarketWatch article -will be about IRS’s new Voluntary compliance program for employers. This entry was posted in *AskTaxMama Newsletter and tagged *Tax Quips, 800.2.INCORP, Andrew West Stockbrokers, Cafe Press, CPA, Donald Korn, Equifax Inc., Eva Rosenberg, fiscal follies, Free, Internal Revenue Service, Intuit Inc, Liz Weston, Nevada, on formation services, Phil Yaeger, Queensboro Shirt Company, social networking page, tax answers, Tax Information, tax podcast, tax questions, tax tips, tax writer, TaxMama, terrific, YouTube Inc, Zazzle - Cafe Press.